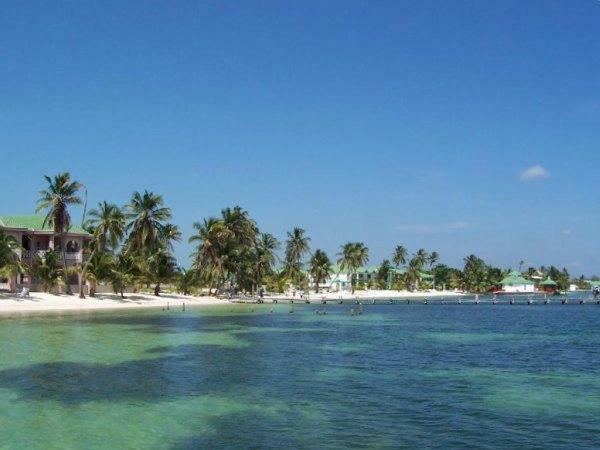 Yes, there are beaches in Belize, but not many. Ambergris Caye has a few worthy beaches, but remember, what makes a pristine diving location is the fact there isn’t much sand around. And so it is with Belize. This place is easy to get to and not far from the USA, so it’s worth a visit if you want to have a little beach time, but really want to see the creatures under the sea. Make sure you get some online reviews of dive operations before you head here. There are some good salespeople on these shores. Also, get your expectations addressed in advance so you won’t be disappointed. First, there are a few excellent beaches that line the resorts and have full facilities and are open to the public. You can generally tell when the beach is man made and closed to visitors. But these are rare in Belize. So your choice is in an around the resorts. Okay, I know what you’re going to say. 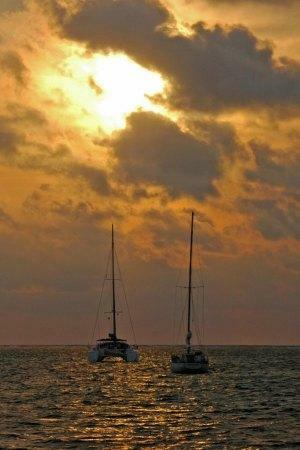 Ambergris Caye is a diving destination, not a beach resort destination of sorts. Snorkeling – yes, scuba diving – for sure, fishing – you bet! All are superb. 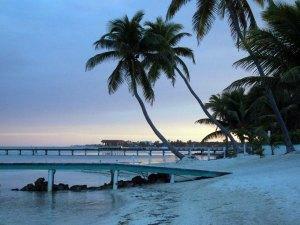 But before you reserve your ticket to San Pedro, know that there really isn’t any beach to speak of on Ambergris Caye. There is a thin strip of sand that runs the length of the island. And when we asked, locals say that even at low tide, you just won’t find a whole lot of room. Tip: Walk north or south from town along the ocean to find a secluded spot where you can sit and gaze on the vast sea. You’ll be alone. Most everyone else is out at the big blue hole, diving. Now some of the beach front hotels have created their own beaches by building retaining walls and filling them in with sand. These are at the resorts on the north half of Ambergris Caye, and at Victoria House. Swimming isn’t very good, either. For about the length of a football field, the bottom is covered with sea grass. And while it doesn’t look good, we agree with the local government that protects this environment which supports a prime part of the food chain. 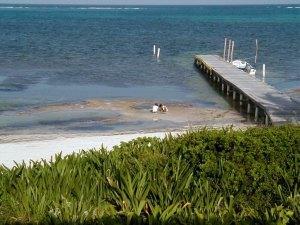 Beneath the sea grass is a layer of spongy roots, organic matter, and white sand. When we walked on it, it was a little unnerving (think stingray or sea urchin). It’s pretty easy to trip as you make your way out. Tip: Swimming is best off the piers and your hotel will probably have one. These normally have steps down to the water and a nice, roped off swimming area. Danger: Don’t try to snorkel out from the shore to the reef. More than one swimmer over the years has been run over by speeding boats. The traffic in the channel is fast and furious. Finally, take a listen to some local opposition to a new development called South Beach Belize. It may disturb the fragile ecosystem of the reef and mangrove rookeries.